Also titled Ultima 0 - Akalabeth. Includes both the unofficial DOS port and the official 1998 DOS port/remake. Both versions are pre-packaged with DOSBox. 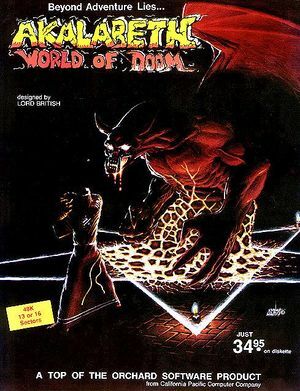 The DOS port of the game (first released in 1998 as part of the Ultima Collection) adds CGA colours and MIDI music. This game does not save any settings. 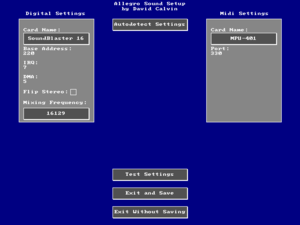 Sound card and MIDI options in setup.exe. 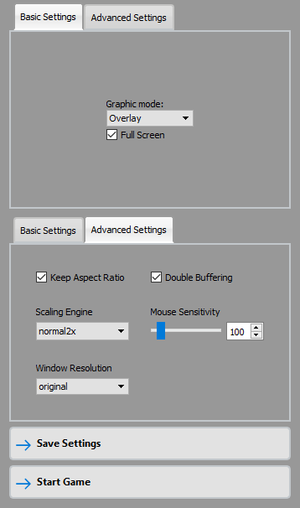 Suggested settings for DOSBox shown. In the Black & White version distributed on GOG.com, Lord British will not recognize any completed quest. Other distributions of this version might also be affected. Download Akalabeth 1998 (Windows).zip - this appears under Game Extras rather than the main download. The official version has minor gameplay differences from the B&W version. In aklabeth.bas, jump to code line 7500. Merge the following indented line onto code line 7500. Play the game with QBasic. CGA 1998 DOS port/remake only.